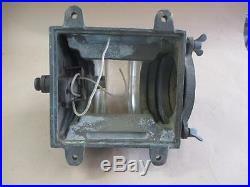 Good quality, heavy brass, masthead light with original clear glass lens. 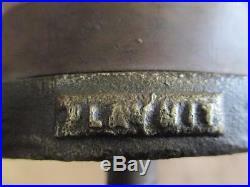 The body is one solid piece of cast brass with separate cap, copper lens fasteners, and fittings. Made in the early to mid-1900s with old wiring still intact. Its surface has a finely textured, sand cast finish. The lens glass is approximately 15 to 20 mm. Weighs 4.5 kg. Condition Very good overall: front hinge cap needs a new pin fitted; cap screws need straightening; chip to front edge of lens; no cracks or repairs. Please look at the photos c. Arefully as they form part of our description. Size: h x w x d cms. 22 x 20 x 15. All sizes are approximate. Get Images that Make Supersized Seem Small. Track Page Views With. Auctiva’s FREE Counter. 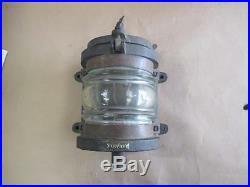 The item “Masthead light, cast brass, solid, vintage, original” is in sale since Saturday, June 10, 2017. 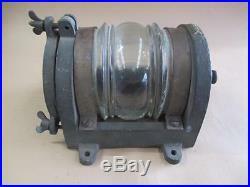 This item is in the category “Antiques\Maritime\Other Maritime”. 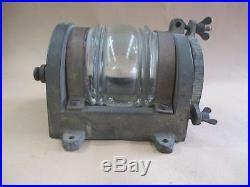 The seller is “lostark0″ and is located in Melbourne. This item can be shipped worldwide.